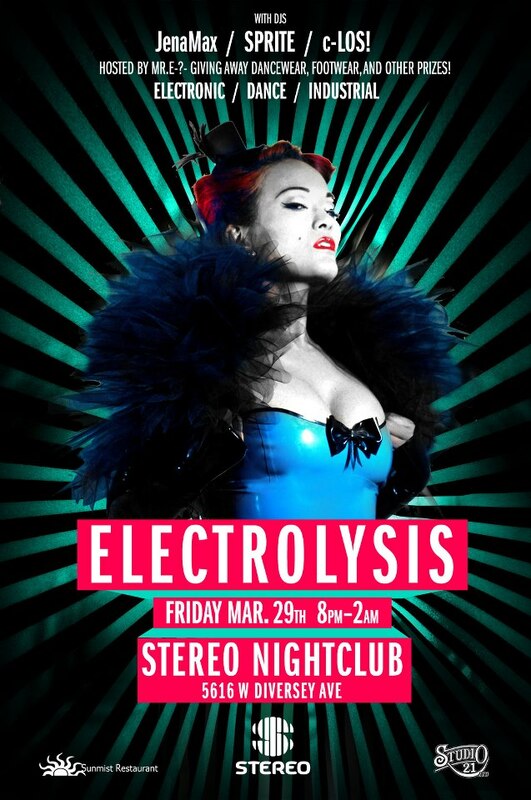 Electrolysis (In electronic music): A sudden urge of the body for rhythmical dance movement. JenaMax (Pandemic Chicago): Industrial and EBM. Sprite (Kinetic Noise): Rhythmic Noise and Techno-Industrial. c-LOS! (Noctronica): EBM and Dark Electro. Hosted by Mr. E-?- handing out prizes from our sponsors! Experience a lesser known more serious music scene, discover Chicago style Industrial dance movements, explore a darker nightlife, and make friends with a goth or someone with an accent! Dress code does not apply this night. For complimentary table reservations or to book a birthday party (free champagne!) click on Stereo’s link below. 8pm-2am/21+/$5 Before 11pm, $10 after, so get your dupas there early! ~ by infomorph on March 21, 2013.